Three prototypes were created to inform and inspire the process and aid in the project’s evolution. It all began with a state of the art Yamaha 900cc Triple at its foundation, of which the first two of the prototypes are based. The third prototype, based on a classic Yamaha 750cc Triple and being more traditionally designed and built, evolved to inform the first two contemporary builds. Introducing and beginning with the Prototype Three, the journey begins. Even though this build started after the first two prototypes went into concept design and development, it was instrumental to the evolution of both and the ultimate aesthetic of the project as a whole. This prototype built on the established design language and build ethos of its Auto Fabrica predecessors; beautifully sculpted, organic and minimal, hand made from aluminium and built on the structure and mechanicals of a classic motorcycle. In keeping with timeless automotive and motorcycle design, the form flows effortlessly and works harmoniously with the functional requirements of the machine. Every detail was understood and considered, boundaries in manufacturing techniques, materials and finishes were pushed; from the engineered and 3D printed velocity stacks through to the signature hand bent exhausts. Back to the initial conception of the Type 11 project; the Prototype One. The first contemporary motorcycle to come out of the Auto Fabrica workshop was destined to be radical and diversifying. 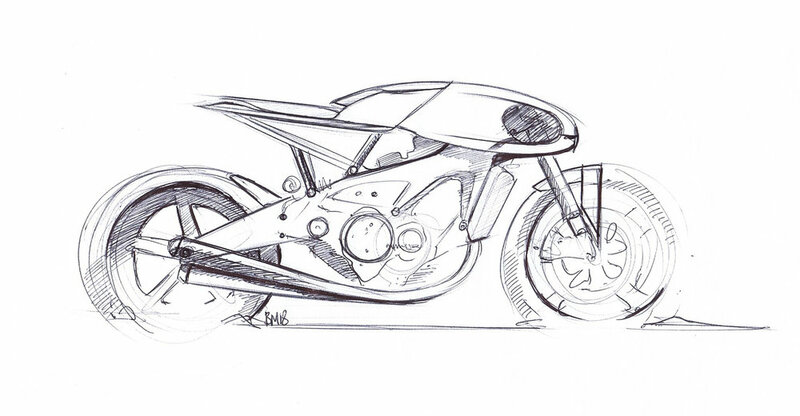 Inspired by pure concept design and adopting styling born out of function seen in automotive and motorcycle racing, the Prototype One was continuously developed and evolved throughout the design and build process. Traditional development in 2D sketching was at it’s foundation but applying all their industrial design practices and knowledge at their disposal, the team continued the build’s progression through CAD design and engineering, rapid prototyping and machining, digital and physical mock-ups resulting in a concept that pushed the boundaries of craftsmanship, technological advancements and design while also continuing traditional values and retaining the Auto Fabrica DNA. You can see how the creation of the Prototype Three has informed the form in many ways, the elegant hand made aluminium tank and fairing being a key evolution with the Prototype One’s body taking this detail to the limits, almost impossibly wrapping the front fairing into the tank. Extreme in all of its proportions and aesthetics, the performance of this machine matches it’s looks. Being race and track focused, the Prototype One is stripped back and raw, from having the highest performing parts by the leading manufactures in the industry and performance driven details like the instant fuelling system, lightweight hand laid carbon fibre race seat unit and carbon fibre and nylon 3D printed components. Destined to be the road going version of the first, Prototype Two used the structure, form and integrity of the Prototype One and incorporated the necessary road requirements. The Prototype Three really came into play at this point, informing the additional road going styling and using a similar colour palette and material choices; the Prototype Two became a beautiful combination of all the conceptual ideas. The headlight became a character feature, highlighting and enhancing the classically inspired form language in this radical and progressive design. Limitless options available on colour, material and finish specifications achievable. Auto Fabrica have extensive experience in the field and the in-house team will work with each client to develop and perfect the finish to suit their style and collection. The Type 11 Limited Production will be an evolution of the Prototype Two specification as requirements for production may involve adaptation and further development.